Matt Sydal is off today’s card, I guess the travel issues from a few days ago are still ongoing (that is the official New Japan word, anyway). Shibata is also out the rest of the tour due to his injuries. They announced that David Finlay is taking Sydal’s place, and whoever wins the match are the new NEVER six-man tag champions. This was a surprising result. Solid match, not much of note. Just your typical opener. Romero submitted to Taguchi’s ankle lock in the upset. Might be a storyline reason to this as Barreta and Ospreay pretty much left Romero in the dust following the match, possibly teasing dissension. This was more of an angle than anything. Yoshitatsu cut a promo announcing that his poll had concluded, and that Captain New Japan was out of the Hunter Club. Yoshitatsu was civil about it, but CNJ turned on him, laying him out and joining Bullet Club in a three-on-one assault. CNJ laid out Yoshitatsu with the uranage and Takahashi pinned him with the pimp juice DDT not long after that. CNJ continued the assault after the match, laying the Bullet Club flag on Yoshitatsu and choking him with a rope. My best comparison for this is like Crush or Horace Hogan joining the nWo C-team. Tenzan, Kojima, and Nagata’s themes all seemed to be dubbed again on New Japan World. Weird. This was pretty good, everyone seemed to step it up a notch. Kanemitsu brought his A game and looked really good here. Kanemitsu brought it early to GBH. He actually showed a great amount of fire and intensity here, but got cut off by a double lariat/clothesline combo by GBH. Honma laid in a Boston crab and Kanemitsu made it to the ropes. He tried a comeback, but Honma took him down again with a Boston crab and this time Kanemitsu submitted. Nagata and Nakanishi worked a lot against O'Reilly. Nakanishi had another off night, struggling to get to the top rope and slipping twice on his way up. Nakanishi at one point overpowered both members of reDragon single-handedly. O'Reilly trapped him in an armbar. Nakanishi tried to get him up, but O'Reilly kept it on. Nakanishi collapsed and eventually submitted. Fantastic match, probably the best match on any show so far. This was a total Young Bucks six-man in that they did a bunch of crazy stuff, especially when Ricochet was involved in the action. It’s hard to describe, as there were so many crazy moves throughout. The crowd was into it. Ricochet wiped everyone out with a fantastic looking dive to the outside. Bullet Club took out Kojima with a triple superkick and isolated Finlay. Nick did a double swanton bomb as Finlay and Ricochet were draped on the bottom rope. Ricochet took out one of the Bucks with a flying cutter, Finlay followed with a rolling senton on Nick then Ricochet hit a great looking shooting star press for the win. Finlay got the mic after the match and challenged the Bucks for the IWGP Jr. tag titles. From what it seems like Sydal has basically vanished from the Earth in this promotion. Briscoes looked very good here. Everyone else held their own and it turned out to be a pretty good tag team match, nothing wrong with it. Tama Tonga got the win for his team, picking up the win with the Guerrilla Warfare. Makes sense as they are the future title challengers, probably at next month’s PPV. Another good tag team bout, but nothing all that special at the same time. Everyone was fine. They continued to build the BUSHI/KUSHIDA rematch as they worked together for a few minutes. Robinson’s teammates did a double plancha as SANADA focused on Robinson. He kicked out of a TKO but got trapped in the Skull End and quickly submitted. Another good tag match that did a good job in building matches for both promotions. They teased the Marufuji/Okada match for next month by having them go at it for a bit, both at the start and towards the end of the match. Jado and Gedo also faced off with Harada and Kotoge as they are next in line to receive a GHC Jr. tag team title shot. Okada and Marufuji came in again and traded some big shots. Yano and YH worked together as well, as did YH and Harada. After some good back and forth, YH picked up with the win with his Karma finish, which is a pumphandle driver. Okada and YOSHI-HASHI made it clear after the match that they wanted a shot at Marufuji and Yano’s GHC Heavyweight tag team titles. Good idea as that brings some intrigue to future NOAH shows. Amazing match, better than the six-man tag in some ways. It was very well paced and never dragged. Even the interference, which seems utterly normal now in New Japan main events, worked well and the last few minutes were incredible, the heat was unreal and the finish was one of the better ones I’ve seen all year. Definitely a must see match. After a few minutes of back and forth, which also mainly involved Naito playing mind games, they went to the outside where Naito targeted the leg of Elgin, which he and the rest of LIJ had been targeting all tour. Naito focused on the leg, working on it, but Elgin cut him off with a big wheelbarrow suplex. 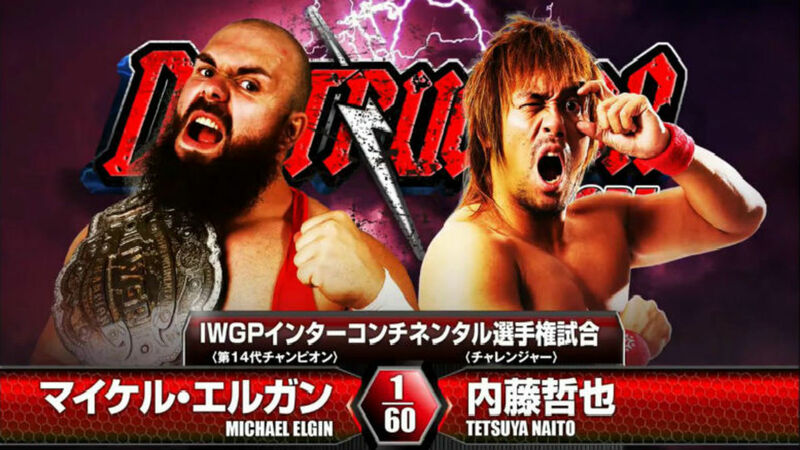 Every time Elgin made a comeback, Naito would go right back to the leg to gain the upper hand. Elgin drilled Naito with German suplexes and even caught Naito with a powerbomb but Naito came back with a tornado DDT, then gave him a hurricanrana off the top rope. Naito followed up with a reverse rana and worked on the leg some more, sinking in a submission but Elgin escaped. He caught Naito on the apron and laid him out with a Death Valley Driver, then followed that with the falcon arrow. Elgin went for the buckle bomb, but Naito countered and took out the ref in the process. Elgin tried to hit the powerbomb but BUSHI and EVIL came out and stomped on him. In response, KUSHIDA and Tanahashi made the save. SANADA came out. EVIL laid out Tanahashi with the STO and BUSHI misted KUSHIDA. Elgin took out the rest of the Ingobernables by powerbombing BUSHI into his team. Naito hit the Destino once the dust cleared but only got a near fall. Elgin laid him out with two lariats but Naito still kicked out. Elgin hit the buckle bomb and went for the powerbomb but Naito countered with the Destino and hit another to win the championship. This was probably the strongest of the three Destruction shows. It had two of the best matches of the entire tour (the main event and the NEVER six-man tag titles match) and the tag matches were okay to pretty good. It’s pretty obvious, however, doing three shows like this is overkill -- it dilutes the cards and makes shows feel very long, which doesn’t happen often for New Japan cards. Today’s show was at least stronger than the others.